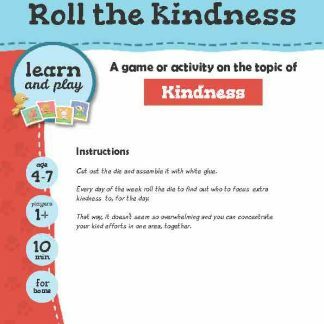 View cart “Spread kindness tags” has been added to your cart. Time to play: 1 min. Use these Kindness tags to help spread a little more love around your home. Cut out the cards and have fun coming up with surprising ways and places to hide them. You could add magnets to the back of the cards and find heaters, hangers, silverware, zippers or any steel surface to hang them onto. Or make them as broaches and secretly put them on another person’s clothes. Peg them onto any string or cloth. Velcro them onto rough surfaces, or cut slits and add them to pencils or spoons or straws, etc. Each time someone finds one, he gets to read it and find it a new home for someone else to surprise and remind about kindness.